Howard Stern is staying on the air!!!!!!!…. 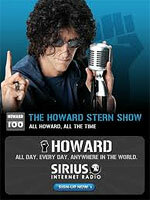 Howard announced last week that he has signed a new 5 year deal with Sirius XM satellite radio. Good news for XM and Sirius listeners. And if you are missing out on Howard his shows has never been better. Fewer ads, no censorship, it’s Howard at his finest. And with two full channels dedicated to Howard, Robin Quivers, Gary “Baba Baba Booey” Dell’Abate and the rest of the Stern gang 24/7, there has never been a better time to sign up for your Sirius XM satellite radio subscription. Sounds Good to Me is YOUR Sirius XM Satellite Radio installation specialist and radio receiver providers. About 75% of name brand AM/FM car CD players are sat ready, meaning an interface and sat (satellite) receiver is needed, usually in the $150.00 dollar plus labor price range. Another possibility is to get a FM modulated version that will interface with any factory radio. Want to listen to satellite in house or office? Simple. Get a Sirius XM Satellite Radio home docking kit and make your unit portable. Go from your car to your house and pay only one subscription fee. Sounds Good to Me is ready when you are for all your Sirius XM Radio satellite needs. And remember the Gift of Howard Stern on makes for a grand Christmas gift this holiday season.